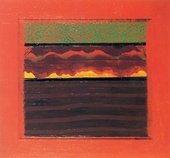 During the late 1960s Hodgkin experimented with different formats and painting supports. In R.B.K. 1969–70, a portrait of the artist R.B. Kitaj, Hodgkin introduced one of his signature motifs, the painted frame. These borders both encase the subject and draw attention to the works as objects. He reinforced this physicality when he changed from canvas to wood – a solid support which allows him to apply many layers of paint over long periods. Around this time Hodgkin virtually eliminated figurative references, restricting himself instead to dots, stripes, splodges and overlapping planes of colour. His subject matter also evolved as he turned to nature and outdoor environments, particularly in relation to his travels. Bombay Sunset 1972–3 recalls a spectacular sunset in India. By transforming the landscape into a brilliantly distilled field of pattern and colour, Hodgkin creates a visual equivalent for his specific memory of this experience.